There are many companies, large and small, who have helped the Sub Zero Mission in ways that are always large to the organization. But it’s hard to argue who has been among the most supportive when it comes to dollars raised and items donated. 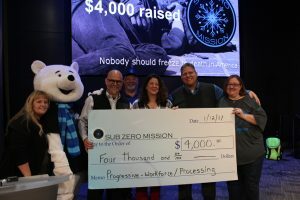 Progressive employees present check to members of Sub Zero Mission Board as Major Shivers looks on. That would be the employees of Progressive Insurance. In 2016, two departments, through Penny Wars and Popcorn Sales raised $4,000 for Sub Zero; an amount Progressive Insurance will match. A presentation was held at the departments’ 2017 annual communication meeting recently. Manager of Claims Workforce and Processing Nancy Collie explained to the employees in the auditorium, at two satellite locations and watching the stream online why they chose Sub Zero. Collie explained that while looking for a charity to support during military appreciation month a couple years ago, they made an important decision. “Let’s just rally around one charity for the entire year so we can raise enough to make a difference,” she said. 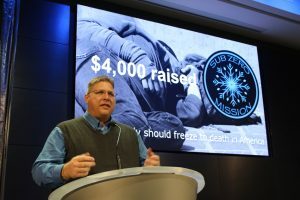 There were many reasons they chose the Sub Zero Mission as the charity to help. The CEO of the Mission Al Raddatz has been a Progressive employee for 20 years. “His charity helps vets and is local. They could really use our help. Let’s do it,” Collie said. Sub Zero CEO Al Raddatz personally thanks Progressive employees. In accepting the generous donation, Raddatz felt grateful for the recognition of what Sub Zero does. “I think that our Mission resonates with people because everybody wants to know that somebody is out looking for people who are lost and forgotten,” he said. He thanked the employees of Progressive for not only this check, but also for the support they have shown to the Mission throughout the last several years. “Each year, Progressive has included us in their America Recycles program. The items collected from this have accounted for one quarter of our total collection of physical donations,” Raddatz said. “Countless employees donate through our website and other ways. Others simply leave warming items at my desk,” he added. “If you ever thought that a little bit can’t go a long a way, just look what the individual contributions of time, clothing, money can do. Look at what you did with Pennies and Popcorn,” he concluded. This kind of support from companies and organizations is what helps aid the mission of keeping homeless warm.